Are you a business owner like Tami? Tami knew she needed a website. After a little research, and on the advice of a few mentors she followed online, she decided to start her first site using the WordPress blogging system. (Over 1 in every 4 sites developed today is on the WordPress platform.) She had a friend agree to get her set up with a semi-customized theme and help her design a logo to incorporate into the look and feel. Yet month after month she saw little results. People said a blog was the way to go. “Google will find you easier”, they said. Which meant clients would find you easier. Yet that simply wasn’t true. All of her clients came to her through personal referrals, or through the networking events she diligently attended month after month. She wanted her blog to bring in new clients she wouldn’t meet networking – maybe even some from different states or countries. “How cool to work with people half way around the world,” she thought. Yet it never happened. What was she doing wrong? Tami is smart, super motivated by her new direction, and is ready to make a difference in this world. She heads online to try new things and to learn from the people around her. But she’s intimidated by the sheer amount of information available to her, and she gets mixed messages with every piece of information she reads. “Try this” – one source promises her amazing results IF she buys this and tries that. So she spends time, energy and money on that, with little impact. Soon she’s off to the next “promise”, hoping she’ll pick up one more piece of advice in the next thing she follows. And while she may be making some progress, she winds up feeling lost and confused. When potential clients meet with Tami, they instantly “get” what she has to say. The problem is they aren’t “getting” that when they visit her site online. Very few connect with her at all from her blog. And even if they do, it’s usually with an email asking for more information, or a phone call to ask a question. Both of which need her to be responding in order to connect and build the relationship. She has a lot of energy going out for her business and her clients. But she would like more energy being put into her blog to create a system that will work whether she’s there or not. She wants sales from her site, without having to be there to answer email or pick up the phone. She wants her site to work for her, so she has more time to devote to the things that truly matter in her life. The reason she started her blog was on the advice of her mentors. Tami knew a blog’s biggest potential came from the content. Creating post after post was the key to success. And she tried blogging – she really did. She created her first post … “Welcome to my blog”. Then she tried another … “Join us Saturday at the Downtown Festival”. She even wrote up a great post with a testimonial her client had supplied … “Testimonial”. But blogging was hard. What did one write about day after day? And soon the concept of blogging was lost in all of her daily activities. Tami understands her business. She conveys it well when she meets face to face. Yet she hasn’t built that storytelling function into her site. When people visit her site, they see a standard format. One page describing her services in a couple of paragraphs. A home page that says little more than “welcome”. And virtually no content beyond the standard five pages that make up the majority of her site. Tami’s primary focus needs to be creating a crystal clear message to reach out to her readers. When they come into her site, she has to focus in on building a relationship from the beginning, long before she actually does business with them. Because Tami has never utilized her blog effectively, she has very little content. Content drives visitors to your site. It allows them to develop a better relationship with you. It allows them to understand you on another level. And it attracts people through a variety of places online, including Google and social sites like Facebook and Twitter. Content drives the Internet world. Without it, your site has no chance. Which is why Ghost Blogging helps jumpstart the content you are sharing online every week. Tami falls in to the trap most people with blogs fall into. 2. She simply doesn’t have the time, the energy, or the resources to add content on a regular basis AND keep wearing all the other hats required to keep her business operational. And that’s where a ghost blogger can help her achieve her goals. 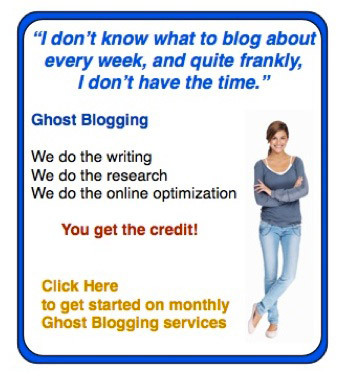 A ghost blogger creates all the content … you get all the credit. A ghost blogger creates the content the visitors to your site want to read, whether they are coming by typing in your URL off of your business card, or through a keyword search performed in Google. A ghost blogger understands content is the key to online marketing for today’s small businesses. In order to succeed and grow online today, it’s all about QUALITY content. Every potential customer has a problem they are trying to find a solution to. Every potential customer approaches that problem in a slightly different way. The purpose of your content is to be there with the right answer at the right time. And once the connection is made, the relationship and the sales come naturally. Tami quickly found her solution … content. And she didn’t have to change a thing. She worked with a ghost blogger to define who her perfect client is, and the ghost blogger began writing quality content to attract those types of clients.